Mama & Little. We're a hard-working mama and papa business that we run with lots of love and dedication to bring you the very best quality and safety possible in a well-designed product that adds to your hip style. Hip for Mama. Safe for little. 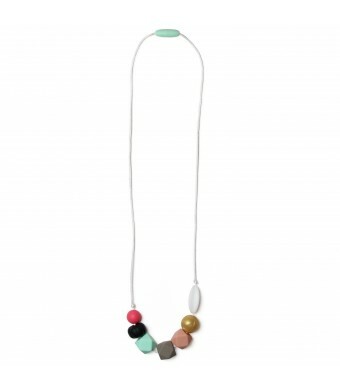 Every Mama & Little Teething Necklace is made from 100% food-grade silicone and hand-crafted with care. This high-quality silicone has important attributes that make it safe for moms and their little ones. Non-Toxic - Our silicone has No BPA, No Phthalates, No Latex, and No PVC. Easy to Clean - Silicone is nonporous so it's easy to clean with soap and warm water or since silicone can withstand high temperatures you can also put your teething jewelry on the top rack in the dishwasher. The Most Functional Jewelry You'll Ever Own. Not only is the silicone in our nursing necklaces and teething bracelets unique, but so is the design of our jewelry. 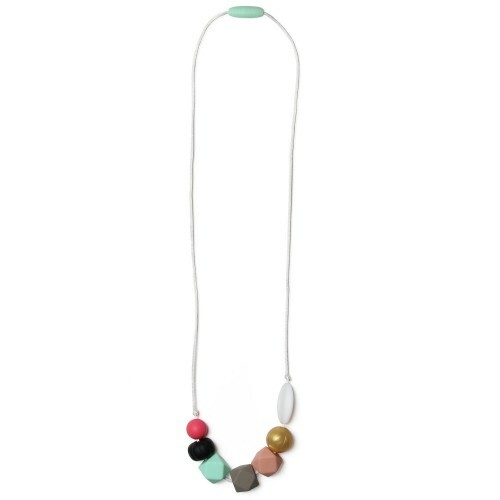 The eclectic mix of bead shapes in oh, so girly colors in our Jess necklace won't only look great on you but will totally attract your little's curiosity. They'll love playing with and chewing on the different textures. Instant fun whenever you wear it. Unlike some other brands, Mama & Little is tested to assure that it meets or exceeds all current standards of the U.S. Consumer Product Safety Commission for safety in both materials and design of our product. ASTM F963-11 mechanical and physical safety testing compliant Don't be fooled by the knock-offs and look-a-likes that don't adhere to our safety and quality standards. Satisfaction Guarantee. We stand behind our products and want you to be 100% satisfied with your purchase. We promise to treat you fairly and reasonably, and will do our best to take care of you. So please don't hesitate to contact us.